Meatloaf. If you think "mundane" when you hear the word, you may want to think about kicking up your meatloaf game. 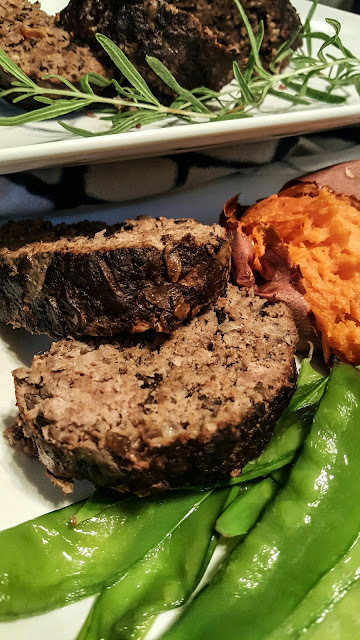 As you peruse recipes in this blog, you may discover that meatloaf is a favorite meal around here. Many Dinner Plan-it twists on this family classic have made the cut over the years: BBQ Cranberry Meatloaf, Turkey-With-All-The-Trimmings Meatloaf (still an all time favorite! ), Old Fashioned Pineapple Maple Ham Loaf...to name just a few of the meatloaf recipes you'll find within these pages. Yet another one has been in the works - and in my smoker - being tweaked to perfection over the last couple of months and is ready to make the scene. The definition of umami dances on your palate with this combo of smoked portobello mushrooms, dried porcini mushrooms, tender beef, and black fermented garlic via my Hickory Smoked Portobello & Porcini Meatloaf. Have you noticed mushrooms seem to make beef even beefier? Smoking the mushrooms first magnifies the flavors even more. Then you smoke the mushroom-y meatloaves for an ultimate meaty, beefy BOOM! In a large skillet, melt butter and canola oil over medium heat. Saute onions, garlic, and red bell pepper until soft, stirring frequently. When the veggies are soft, add minced smoked portobellos and ground dried porcinis. Combine well with the rest of the veggies, season with porcini salt and black pepper. Set aside to cool. When the veggies are room temp, put ground beef and beaten eggs into a large bowl, add cooled veggies. Mix lightly, but thoroughly, with veggies evenly distributed throughout the mix. Divide into four portions and make four meatloaves. Preheat smoker to 225 degrees, using soaked hickory chips. Only you know your smoker and the type you have. I have an electric chest-type smoker. I smoke meatloaf about five hours. Your time and temp may vary. I also cut squares of parchment paper to place the meatloaves on in the smoker - makes taking them out a cinch. Why 4 meatloaves at once? One to eat, one to share, two to freeze for later! Notice there is no bread in the recipe? That makes it naturally gluten-free and paleo friendly! NOTE: Don't have a smoker? Roast the portobellos in the oven, cool, and proceed as above. Bake the loaves in the oven at 375 degrees for 1 1/2 hours or until done. Weekends are for brunch! Whether you hit a downtown hot spot with a kickass bloody mary bar (I'm looking at YOU, Meat & Potatoes!) or stay in your pj's and keep it casual at home, brunch should be a hell of a lot more special than your typical weekday green smoothie, bowl of cereal or a protein bar. Weekend brunch is a time to celebrate making it through the week! The luxury of time is the key ingredient in any brunch recipe. Homemade brunch goodies (including a home version of a damned good Bloody Mary, Mimosa or even a cool weather Irish Coffee, of course) are best made at your leisure while reading the morning newspaper, sipping a hot cup of coffee, and discussing the previous evening's escapades with a friend, spouse or even (depending of the level of hijinks) co-conspirator. So put your feet up on the coffee table, turn on CBS Sunday Morning, sharpen your pencil to tackle the crossword puzzle, all while enjoying a relaxing and special brunch that tastes just like you got up, got dressed, got out and fought the crowd at the Bloody Mary Bar. 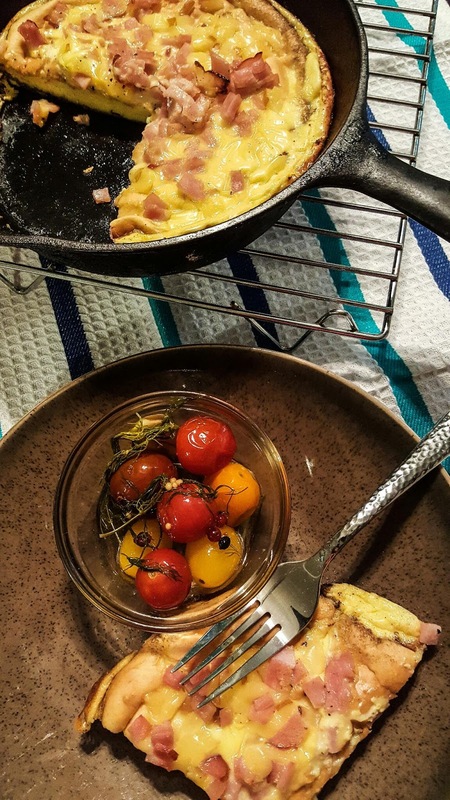 Your new fave brunch may just be the one you make at home....in your pj's. Preheat oven to 375 degrees before starting batter and filling. When your oven comes up to temp, put a dry cast iron skillet into the oven to heat while you make the pancake batter and filling. Put all the above (except the butter - that's for the cast iron skillet) into the bowl of your electric mixer. Using the whisk attachment (if you have one) beat for 5 full minutes, stopping occasionally to scrape down the sides of the bowl. Set aside. Prepare the onions and let cool. In a small bowl, beat the egg, half & half, and seasonings together until well combined. Add the ham, cheese and onions - mix well. Set aside. Open the oven and put the 2 T of butter into the hot cast iron skillet. Close the oven and wait for the butter to melt. Carefully swirl the butter to completely coat the bottom of the skillet. Pour the batter into the skillet and bake approximately 20 minutes or until set and fully cooked. Remove from oven and let cool 2-3 minutes. Pour the filling mixture into the center of the Dutch Baby, top with a little extra diced ham, and return to the oven for another 15-20 minutes until set. Remove, cut and serve. I made a few small changes to the Food Network Magazine recipe - mainly more spices and garlic. Next time I'll try adding jalapeno or serrano peppers for even more heat. 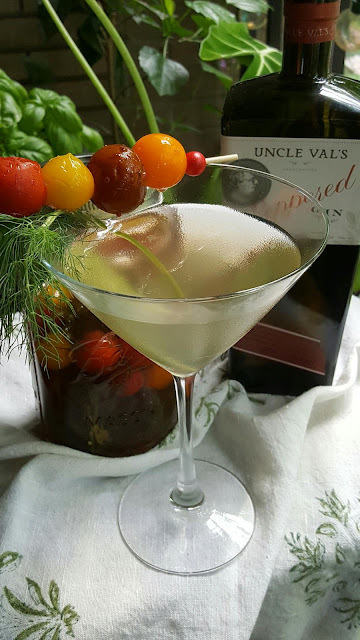 One of the benefits of cherry and grape tomatoes is that there are always tasty and colorful baskets of these lovlies year 'round. You (and I) can make them anytime! Have a clean 1 quart canning jar ready. Bring vinegar and water to a boil. Add sugar, Kosher salt, coriander, mustard seeds, red pepper flakes, and the various peppercorns. Stir until sugar is completely dissolved, remove from heat and allow to cool while you proceed. 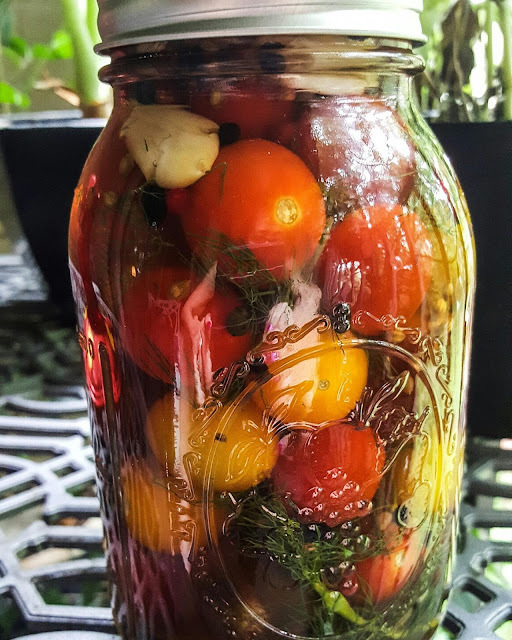 Put a couple of dill sprigs into the bottom of the quart jar, add a layer of tomatoes and a smashed clove of garlic. Repeat the layers until the jar is nearly filled. Pour the warm liquid into the jar, cap and allow to cool completely on the counter. Refrigerate. The tomatoes will be ready to serve the next day. Fettucine is a simple dish perfectly suited to being a quick and easy dinner. Don't have smoked garlic on hand? Use roasted garlic instead. Smoked or roasted, the garlic flavor in this easy dish is mellowed out and lush. Don't like garlic? Leave it out. No biggie. Whether you smoke or roast your garlic, the prep is the same. Taking a whole head of garlic, cut the very top off the head, just exposing the meat of the garlic cloves. Wrap the bottom of the head with foil, leaving the cut surface exposed. Drizzle olive oil over the surface and either pop into the smoker along with whatever else you're smoking that day or into the oven with whatever you're roasting that day. Simple! Now about that fettucine. 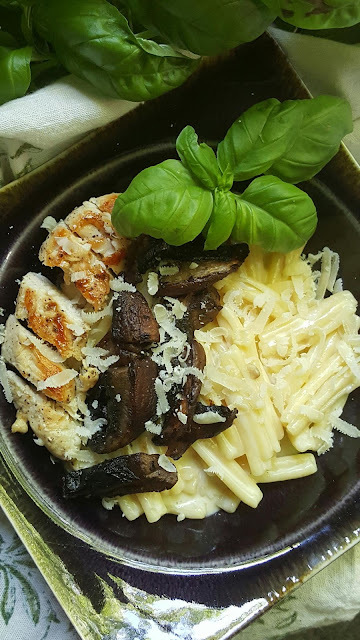 I didn't use the traditional fettucine noodle because I didn't have the gluten-free version on hand. Just about any good noodle or pasta shape works well. Come on, it's the rich and creamy, cheesy and buttery sauce that's the star of this show. Along with smoked garlic, of course! 2 C freshly grated parmesan - use the GOOD stuff! Squeeze the soft smoked (or roasted) garlic from the head of garlic into a small bowl. Add the salt and pepper and use a fork to mash it all into a paste. Set aside. In a saucepan, warm butter and cream together over low heat until the butter is melted. Add the garlic paste and whisk until combined. Let simmer gently while you cook the pasta. When the pasta is done, drain well and pour it into a large bowl. Add half the parmesan, the sauce, and gently toss. Add the rest of the cheese and toss gently again. Serve by itself with a green salad or topped with grilled chicken and portobello mushrooms. Smoked or roasted garlic: Slice the top of a head of garlic, exposing the cloves. Wrap the bottom with foil, drizzle with olive oil. Smoke at 225 degrees (in your smoker) along with whatever else you're smoking at the time. I regularly smoke several meats, onions, tomatoes, garlic and other veggies for later use. I make the most of firing up the smoker! And I do several heads of garlic at a time. Wrap the heads in foil completely when done. Stores in the fridge for a week or so. Or you can separate the cloves and freeze in a small freezer bag. In the oven, roast at 400 degrees about 20-30 minutes or until the center is soft. Wrap completely in foil until ready to use. Stores in the fridge for a week or so. Or you can separate the cloves and freeze in a small freezer bag. We've had quite a depth of Beard nominees here in the 'Burgh for the last several years. 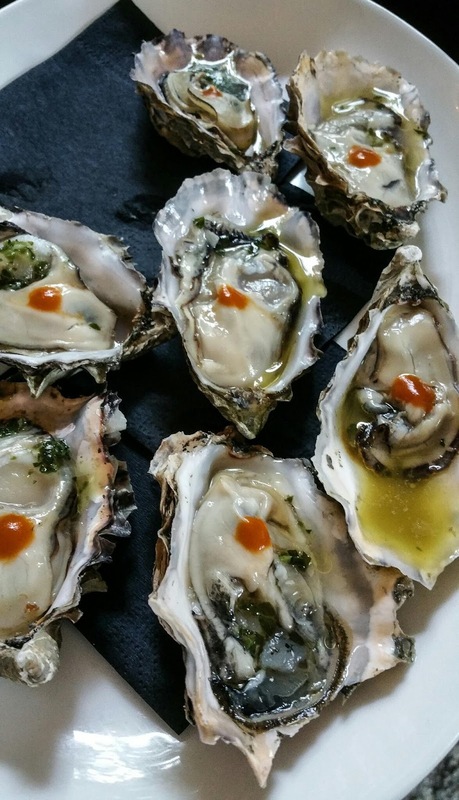 Justin Severino has been nominated three times for Best Chef: Mid-Atlantic. 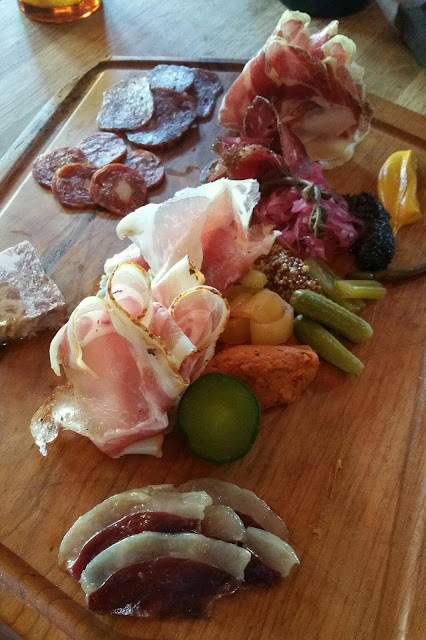 Justin's newest restaurant, Morcilla, received a nomination this year for Best New Restaurant in the country. 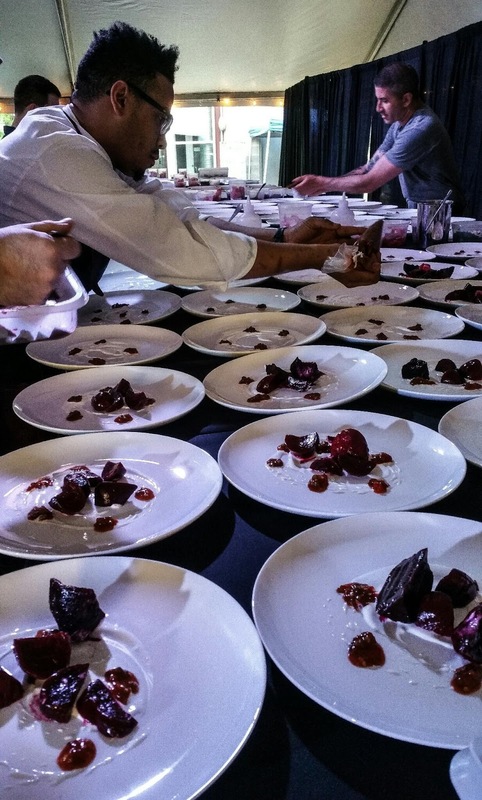 Jamilka Borges, now of Spoon, and Sonja Finn of Dinette have both been nominated for Rising Star of the Year, as well as Trevett Hooper, of Legume, having been nominated for Best Chef: Mid-Atlantic in 2013. And when it comes to local restaurants and restaurant groups, James Beard accolades have been sprinkled across the local landscape pretty liberally as well. 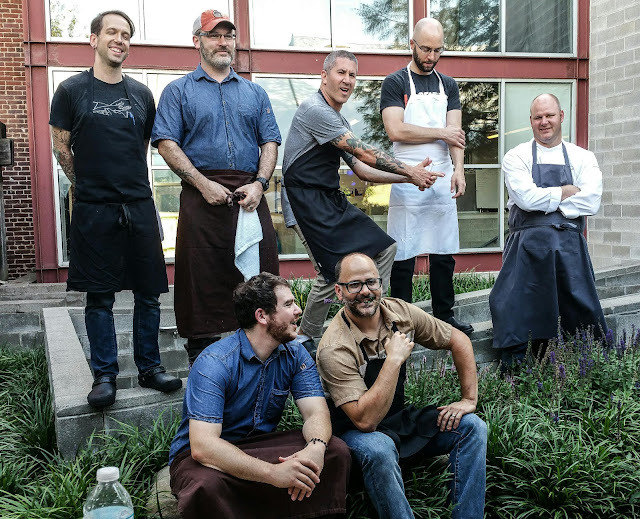 The Big Burrito Group's Bill Fuller and Tom Baron have been nominated for Outstanding Restrauteur and Butcher and the Rye was nominated for Outstanding Bar Program in 2014. Pittsburgh represents! 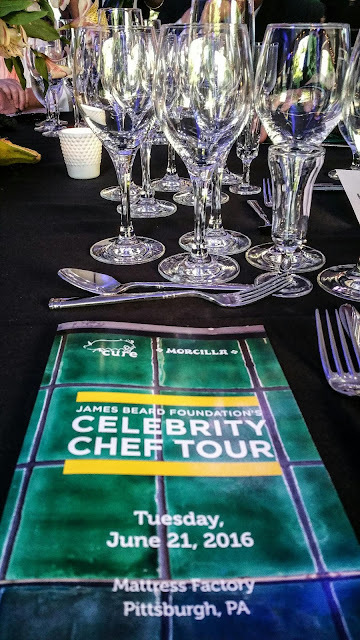 As a result of Pittsburgh's wealth of food and cocktail professionals and programs, last week saw the second James Beard Foundation Celebrity Chef Tour dinner to be held right here in Pittsburgh. My friend Marti (from Maryland) and I were there last year for the inaugural event, and she made the trip again this year to make it two in a row for us both. How did we make this year's James Beard Dinner even more memorable than last? By turning it into a three-day-Justin-Severino-tour-de-force. That's right, we constructed a sort of Justin-Severino-themed-dining-sandwich consisting of a Monday at Morcilla, a Tuesday filling of James Beard, and a Wednesday finale of Cure. Three days, man! This is how it went...first up, Monday at Morcilla. 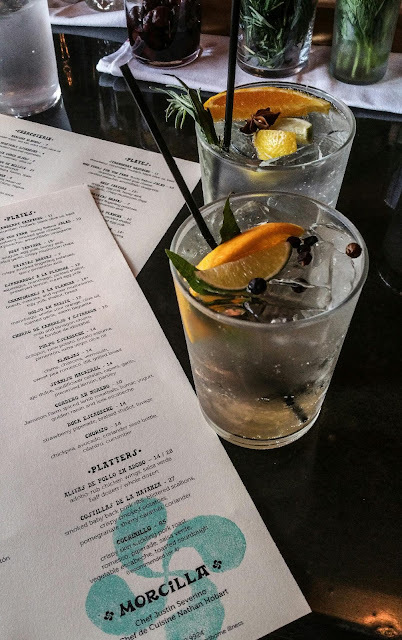 What better way to begin than some of the best Gin & Tonics in town?! 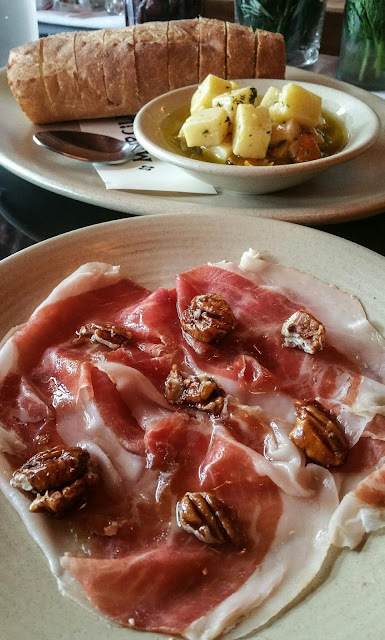 Foreground: Edwards Surryano ham with pecans and pecan oil. A true find! Background: Manchego with Seville sour orange, olive oil, and roasted garlic. There were Patatas Bravas with a divine pimenton aioli to round out the feast, too, that didn't make the pic. Tuesday. The BIG day of our second James Beard Foundation Celebrity Chef Tour dinner in Pittsburgh...the meat of this dining tour sandwich you might say. We couldn't wait to see what awaited this year. Last year's venue was the Heinz History Museum in the Strip District. This year the event was held at the Mattress Factory on the North Side. Justin's and his wife Hilary's choice to hold the events at Pittsburgh museums is spot on. The food itself is art. Outdoors under grand tents, the evening started with lovely and tasty bites provided by Sonja Finn, Kate Romaine of E2, Trevett Hooper, Bill Fuller, and Curtis Gamble of Station. Cocktails created and provided by Morcilla, Cure, and Aldine were a refreshing start given the heat of the evening. Alas, there is but one lone, but beautiful, pic! Grilled Pacific Oysters with ramp butter and hot sauce by Sonja Finn of Dinette. On to the main event under the big tent! Unfortunately, the photos were less than stellar from that point on due to the onset of darkness and the blue lighting under the tent. Although the lighting faded, the food continued to shine. Justin's Foie Blonde dazzled! With strawberry rhubarb jam, candied pistachios, dehydrated black olives and lovage, the flavors burst! 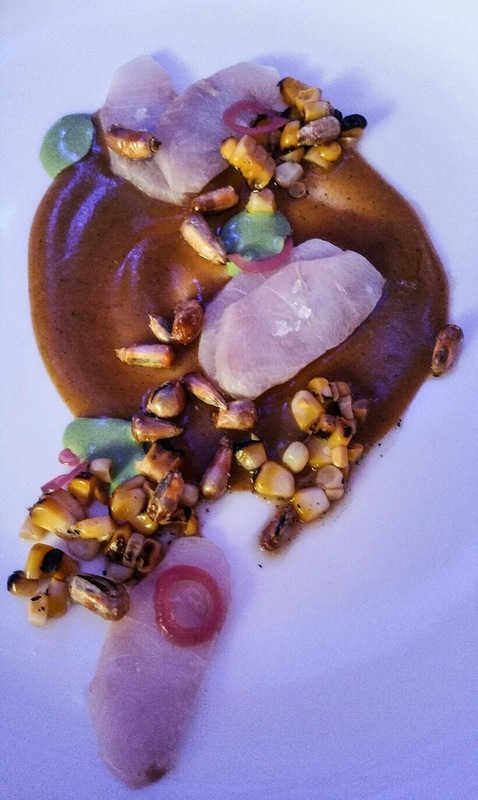 The aroma of roasting duck wound it's way throughout the anxiously awaiting throngs of diners, tempting us before Scott Drewno (Executive Chef from The Source by Wolfgang Puck) presented his Roast Pekin Duck with crushed peanut curry and candied lemongrass. One word. Wow! Not to be outdone, next up was Squirrel Hill native son Michael Solomonov with succulent roasted beef short ribs, green chickpeas, tehina and matbucha that seriously simply melted away on your tongue. Dessert? Of course it lived up to the excellence and deliciousness of the courses that preceded. We were each presented with an individual cardboard pint ice cream container containing the classic Neopolitan flavors of strawberry, chocolate and vanilla creams interpreted to a whole new level. We were all sent out with not only memories of the sweetness of dessert, but of the magnificence of the evening. Then came Wednesday. Our final celebration of Severino Days ending at Cure. And we hated to see our Pittsburgh ultra fine dining adventure come to a close. Naturally, we started with a toast! 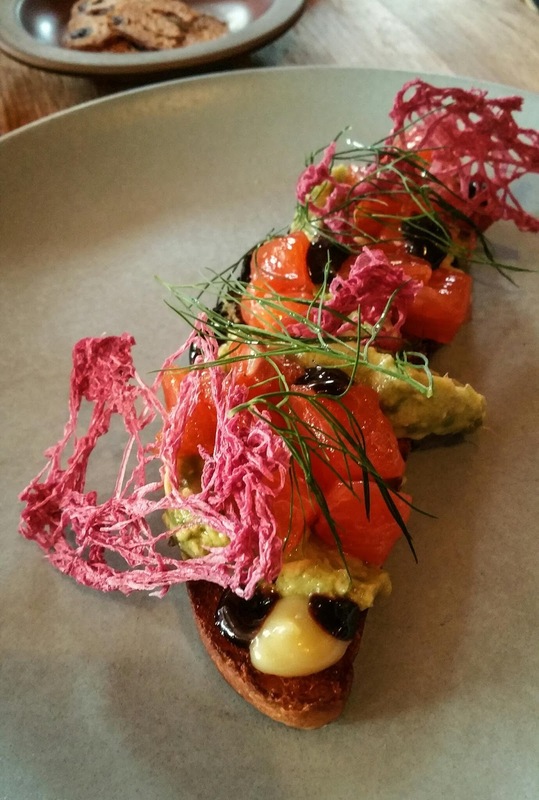 Worthy of being painted, next was the Coho Salmon Crudo on foccaccia toast, avocado, black garlic, preserved lemon, dehydrated red onion and dill. Some of the staff remembered us from the previous night's bash and we shared it was our third night in a row of celebrating Justin Severino. Who knew a little surprise would arrive at our table?! 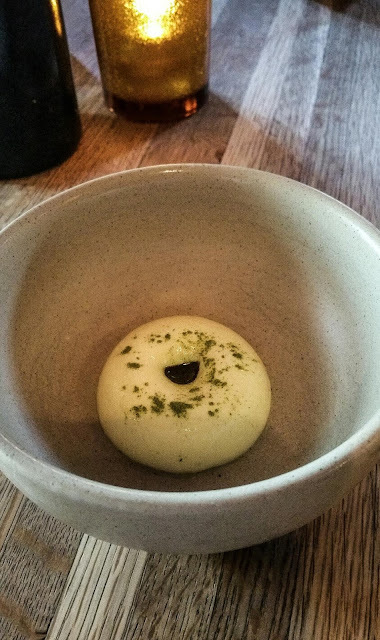 A delicate puff of green cardamom, black olive, and a sprinkling of crisp catnip awaits. 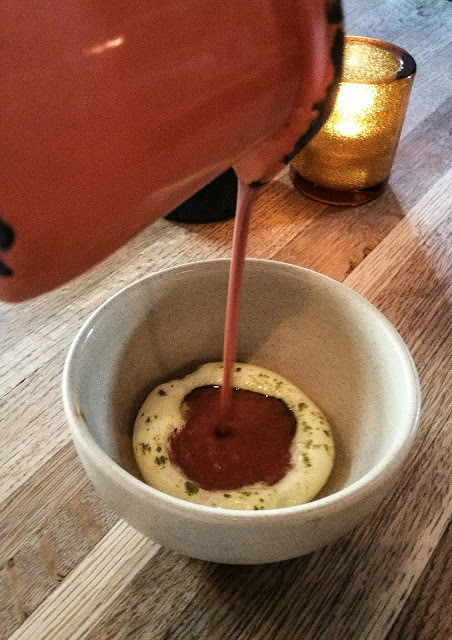 Strawberry gazpacho is poured over the foam to create a symphony of texture and flavor! The finale? Salumi. Yes, our dessert this night was MEAT! There couldn't be a more suitable ending to our Severino Celebration than ending where it all began for Chef Severino...with meat. What will next year bring? 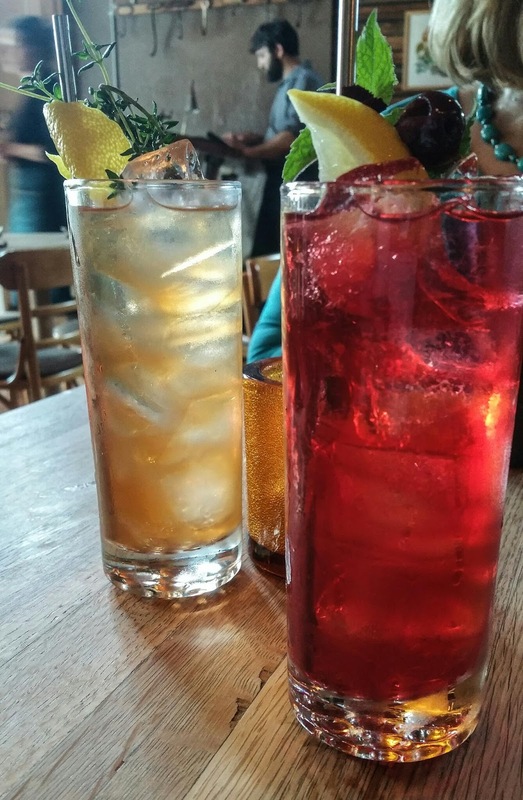 Can't wait to find out - not just for next year's James Beard dinner, but to see what is on the horizon for Pittsburgh's culinary and cocktail world. Look for exciting things, people! 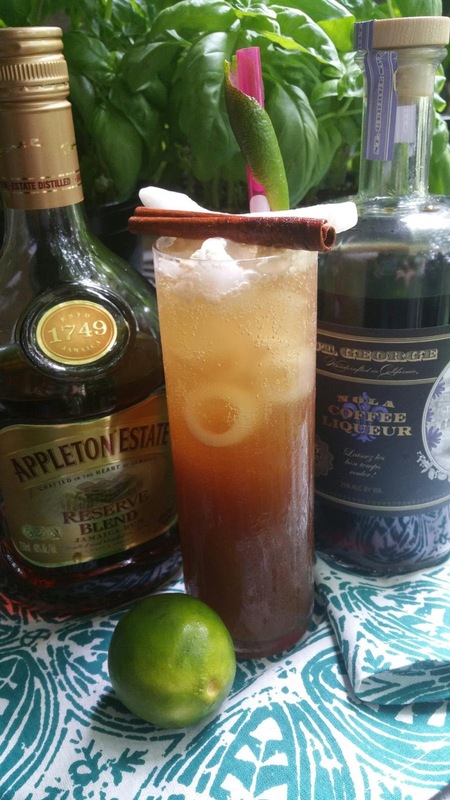 Imagine your favorite iced coffee and an ice cold Coke had a baby...a Caribbean baby, baby! 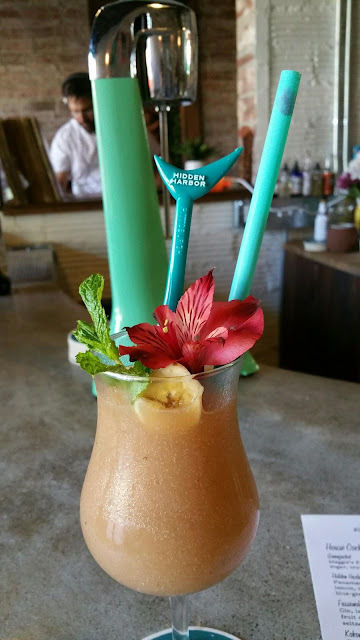 There's no doubt my Jamaica Mon Coffee Rum & Tonic was partially inspired by Hidden Harbor's new icy, slushy, frozen coffee/banana/rum and spice delight, the Oka Kope Kooler...it's my current tiki crush at Squirrel Hill's hot spot. Then, too, Alton Brown recently posted a recipe for his cola syrup; I whipped up a batch of AB's syrup and got down to some serious testing. What resulted was a tall, crisp, little-bit-sparkly summertime refresher with a good buzz of caffeine (via the coffee and cola), and a light kiss of chocolate courtesy of the bitters. Notes of cola spices, a wee touch of coconut, a little tartness of lime and a finish of summery not-just-for-gin tonic might lift your weary spirit from the shores of the Mon to the soothing turquoise waters and white sands of a beach somewhere in faraway Jamaica. Why Jamaica Mon? Because Jamaican rum. And Pittsburgh's own MON-ongahela! 1 barspoon cream of coconut - or 1/2 t.
In a cocktail shaker, combine rum, coffee liqueur, coca cola syrup and cream of coconut. Dry shake. Add ice and shake again until tin is frosted. Strain into an ice filled glass, add the bitters, stir gently, then top with tonic and a squeeze of lime. Stir gently again. Garnish with lime peel and a grating of nutmeg. In a small saucepan, bring the Coke to a boil. Add the demerara sugar and stir until the sugar is completely dissolved. Cool and store in a covered container (I use a Mason jar) in the fridge. Looking for something just a little different on the grill the other day, I put together this Greek-inspired dinner. It was almost a complete dinner-on-the-grill meal with the veggie skewers I grilled at the same time. Well, I did have to make classic Greek tzatziki to spoon over the sliders. Because tzatziki! What makes these sliders a little bit Greek? Feta cheese for starters...and the classic Greek flavors of lemon, oregano, and garlic with some fresh spinach for color and juiciness. In fact, if you think of ground chicken as lacking in moisture, this is just the mixture to dispell that thought. Tangy feta, tart lemon, earthy oregano, zippy garlic and green spinach make these sliders a burger mixture you and your guests will really enjoy! If you can find long, flat bamboo skewers, they are the best! Burgers, sliders, meatballs or whatever you skewer and grill stays put instead of rolling around a round skewer making it a pain to easily get nice grill marks on both sides. Look at the grill marks in the pic! These are so easy to turn and flip, I'm picking up a new supply when I get to World Market in Michigan next month. To serve, tuck a slider into a wedge of toasted pita or onto a slider bun, garnish with grilled veggies and slather with a healthy helping of cucumber-y, minty tzatziki. Eat. Repeat! Mix all together well, but lightly. Form into 6 flat patties. 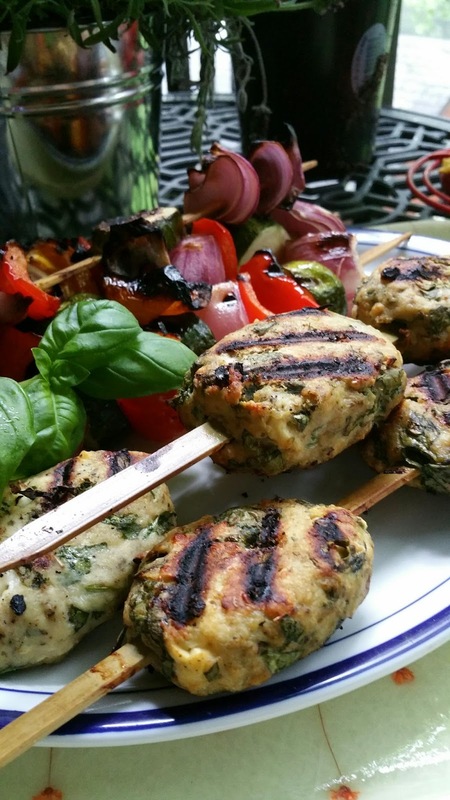 Refrigerate at least an hour before inserting skewers - or skip the skewers and just make burgers. Grill until cooked thoroughly - no pink chicken, please! Serve with your favorite grilled veggies - I served zucchini, red onions, red and yellow peppers. And tzatziki! Drain the liquid from the grated cucumber, then mix all ingredients together in a large bowl. Chill until serving time. NOTE: I usually buy the yogurt in quart sized containers and use the whole container to make a double batch of tzatziki. Nighttime snack attacks become healthy and low cal...as long as you're not dipping potato chips into it!